We are about to start another basketball season with our ON-LINE registration for the 2018-2019 season commencing on September 1st thru October 31st. SYBA now has over 1,000 players playing basketball in different age groups. Pretty exciting! 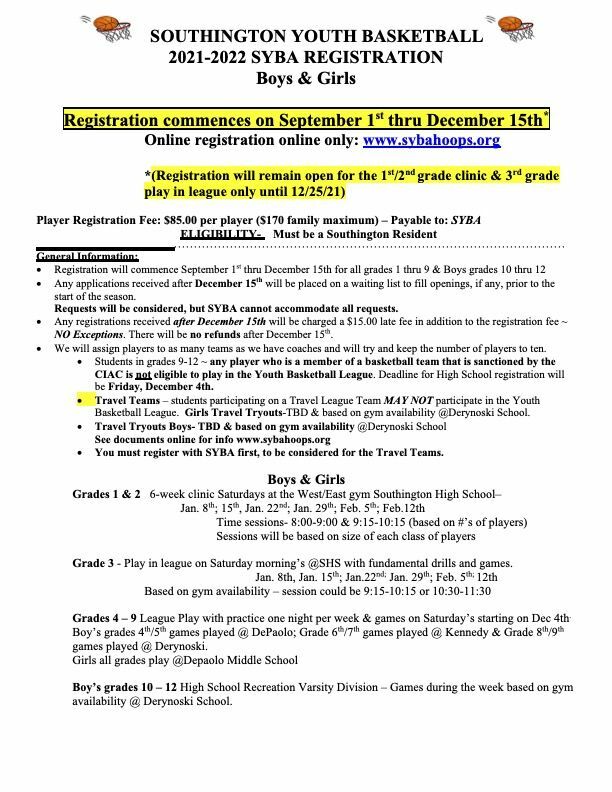 With our on-line registration going into its 4th year, it is much easier for all of you to register while at home or in your office at www.sybahoops.org. So register early! We have a couple of changes being made as part of our strategy to only have clinics for grade 1 and grade 2. Grade 3 will now have a play in league. This means every 3rd grader will be part of a team but with a different twist. We will have 6 sessions on Saturday mornings at Southington High School. January 5th, 12th, 19th, Feb. 2nd, 9th and 16th, we will have coaches teach fundamental drills and then play games. This will be a good entry into the playing league for all 3rd graders. I hope you take the time to review the happenings of SYBA Hoops as we continue to grow and change the culture. Please feel free to reach out with questions, concerns or new ideas. Looking forward to a successful basketball season.